How deep is every tube station on the Underground? A question you have probably never ever asked yourself is what is the depth of every single tube station on the Underground, but now the question has been asked, you are probably really curious to know the answer. Someone else was also curious, and filed a Freedom of Information request, so the data is now in the public sphere for us to crawl over. The figures are (apparently) in metres above sea level – but then weirdly adjusted by LU by 100 metres. I’m sure there is a exceptionally good reason for that buried in the archives somewhere. For example, at Camden Town station the two Northbound platforms are at the same depth (111.8 metres), but the Southbound platforms differ by 90 centimetres from each other (109.3 and 108.4 metres). Other such amazing facts were revealed in an Excel spreadsheet, which I have cleaned up a bit and you can download from here. I suspect someone is busy updating a detailed map of the underground network as you read this. 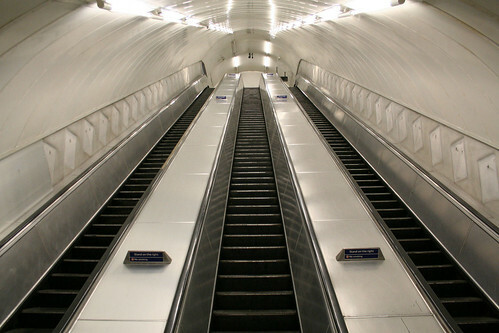 Other exciting facts about the Underground for use in your next pub quiz can be found here. Will certainly make for some interesting 3D maps. As it happens, the track layout schematics are held at the TfL archive and they could probably be converted into digital diagrams of some sort. I was peering at some only yesterday as it happens. Why would I email the file to you when you can just click on the link I put in the article above? I didn’t use Ian’s nicely-cleaned Excel spreadsheet but I did use the raw FoI request data to produce a 3D visualisation using my ViziCities platform (https://github.com/robhawkes/vizicities). Let me know if you have any questions about it! I’m sure there is a exceptionally good reason for that buried in the archives somewhere. Avoids having to work in negative numbers? I haven’t changed the numbers at all – which is why I wrote (apparently) as I am not entirely sure how they calculate it. Looking at – for example – Waterloo which is said to be the deepest station below sea level, and on the tables shows as quite a small number I presume that is what happened. The figures will be altitude, with the 100m adjustment to datum to avoid negative numbers. So the data doesn’t really tell you the depth of each station, unless you can also find out the altitude of each entrance. Which is presumably what the street level figure is for? Aaaah – now that would make sense! So subtracting 100m from the track values, and then subtracting the result from the ground above sea level (outside station), should give us the track depth below ground level for any given station location. I get some significant negatives, such as Greenford (-10.2). Can you explain this? Thanks for acquiring the data, i can’t find any other source, good work. As Greenford station is above ground, it should register a negative figure. Both sets of data come from TfL – any queries about anomalies will need to be directed at them. Interestingly the spreadsheets shows values for Wembley Central on the Piccadilly line. This should be Bakerloo. To workout the depth from street level to the platform, do I just have to subtract the mean level from the Ground Level outside station? I am confused where the extra 100 metres has been added on. Thank you! The info for Uxbridge is wrong – the platforms are at the same level as the station, however your data indicates otherwise. Bu@@er – just read the bit about having to subtract 100. sorry ! 1 Pings/Trackbacks for "How deep is every tube station on the Underground?"